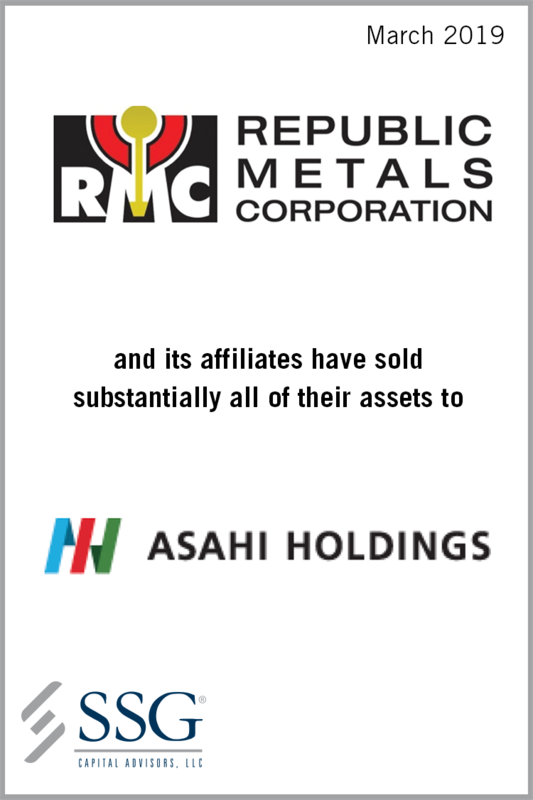 SSG Capital Advisors, LLC (“SSG”) acted as the investment banker to Republic Metals Corporation and its affiliates (collectively “RMC” or the “Company”) in the sale of substantially all of their assets to Asahi Holdings, Inc. (“Asahi”). The sale was effectuated through a Chapter 11 Section 363 process in the U.S. Bankruptcy Court for the Southern District of New York. The transaction closed in March 2019. RMC is a highly respected, internationally accredited, primary precious metals refinery and mint located in Miami, Florida. The Company’s services include stone removal, diamond acquisition, vaulting, assaying, risk management and hedging. RMC also operates a state-of-the-art carbon sampling and processing facility. In 2013, the Company invested in a new silver refinery to significantly expand its silver production and complement its existing gold refining business. The refinery required a significant investment of capital to finance the start-up and ongoing operations, as well as to ramp up to profitability. RMC struggled with constrained liquidity and increased financial and operational complexities related to the new refinery and defaulted on its debt obligations in July 2018. After evaluating alternatives, the Company determined that filing for Chapter 11 protection provided the best opportunity to effectuate a transaction and properly capitalize the business for future growth. SSG conducted a comprehensive marketing process that led to a stalking horse buyer, multiple bids from international strategic buyers and a competitive auction that lasted 28 rounds. Asahi’s bid was ultimately deemed the highest and best price for substantially all of the Company’s assets. SSG’s experience in identifying buyers and running a thorough sale process enabled stakeholders to maximize value while preserving jobs. Headquartered in Japan, Asahi (TSE: 5857) focuses on three global business segments: precious metals, environmental preservation and life & health. The precious metals business engages in the recycling and selling of precious and rare metals, as well as the refining and processing of precious metals. Asahi recently announced that it had acquired RMC to establish an even stronger presence in the precious metals segment in the North American market, add product fabrication and carbon treatment to its list of business areas, and develop new customers and increase revenue by capitalizing on its excellent comprehensive capabilities. Rocky Ho, Brian Fenley and Colm Hannon of Ernst & Young LLP, financial advisor to Asahi Holdings, Inc.